Frutero local de cortesía, chocolate y café orgánico. El baño incluye inodoro, ducha, tocador, lavadora / secadora, secador de pelo, plancha, lavadora y secadora. We very much enjoyed our time staying here. Teresa was a wonderful host. The studio was clean with all the amenities that you need. The pool was also beautiful and perfect for getting some extra sun after a fun day at the beach. The perfect place to stay for a first visit to Hawaii. The photos do not lie! The studio is very clean, comfortable and had everything needed. The welcome bowl of fresh local fruit, chocolate and coffee was a lovely touch. 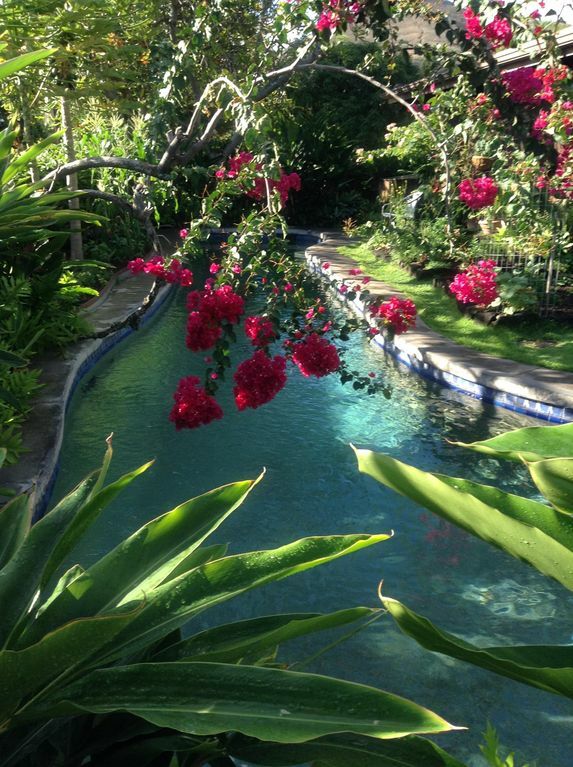 It was wonderful to wake to bird songs, have breakfast on the patio and swim under the bougainvillea, always in the midst of a tropical garden. Teresa is a gracious hostess, friendly, informative and kind. She really goes out of her way to make sure her guests needs are met. This was truly a home away from home. Would love to stay here again if we ever return to Lanikai. We loved having Barbara & Ken to stay! They are such a gentle, kind couple. It was nice to chat with Barbara by the pool one evening. This was their first time to Hawaii, and I am grateful they chose to stay with us for their initial immersion! Could improve with some more comfortable chairs for the deck and house ( set up for a day bed inside ). Teresa is a great host who has the knowledge of someone born there, along with her kindness and willingness to be accommodating. It was lovely to get to know Cathy & Fabian during their extended stay with us. They were great guests! We are in the process of ordering a couple of new, more comfortable, patio chairs for the porch. With the limited space inside a studio we have to combine sleeping arrangements with the ability to lounge, so the day bed serves as both. We hope to see Cathy & Fabian again on their next visit to Lanikai. Cozy suite in a great location, easy access to beach and a helpful host to boot! We loved having Carter & Michelle to stay over the Holidays. They were excellent guests. Their baby boy, Archer, was such a joy. His smile just opens your heart! My husband and I stayed for 1 week and enjoyed every moment. The owner left a welcoming basket of deliciousness (local fruit and chocolate). It's a short walk through a beautiful neighborhood to the beach. The home has everything you need and it's quite comfy! It's also away from the hustle and bustle of city life, so it's very relaxing. Thank you Linda & Bruce! I am so glad you enjoyed our "home away from home." We would love to have you stay again the next time you visit your daughter. I am so glad that Jim and his daughter enjoyed their stay with us! They were lovely guests. Otras Actividades: A una cuadra de nuestro camino a la cercana playa de Lanikai-derecho de vía y tres pequeñas manzanas a la gran playa de Lanikai; kayak, canotaje, parapente, ciclismo, salud / belleza spa; Lanikai parque con cancha de baloncesto y columpios.